Wire Erosion is a particularly valuable resource to cut complex shapes in tough materials, it’s a process that cuts metal by creating electrical sparks between the workpiece and a metal wire. As the wire moves along a path created by computers, the sparks remove the material. 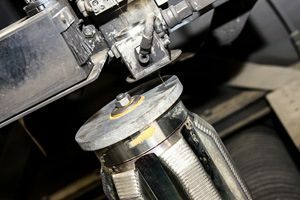 Wire Erosion can cut up to 150mm of thickness; thinner layers will need to be layered up to prevent them from braking, providing they are all of the same material. This is often more economical. To start this process you must either start at the edge or drill a hole where you’d like it to start. The wire is inclined to make it possible to make parts that have different profiles at the top and the bottom. With Wire Erosion, there isn’t any mechanical contact between the electrode and the workpiece. The wire used in this process is normally brass or copper between 0.1mm and 0.3mm. Spark and Wire Erosion are two very different processes. Wire Erosion (an EDM process) is the method of cutting metallic workpieces with pure metal wire. Advantages of Metal Wire EDM can provide HD accuracy for close and tight fitting parts. The process can create sharp inside corners whether it is thick or thin material. Depending on the accuracy and surface finish you need, parts can either be a one cut or it can be roughed then skimmed. With a one cut, the wire will pass through a solid part making scraps drop away. Why choose MNB Precision Wire Erosion Services? Here at MNB Precision, you can expect only high-quality Wire Erosion Service. We provide exceptional surface finishes down to 16Cla are achieved from the Wire Erosion method of cutting metal. We offer a variety of wire diameters ranging from 0.15mm to 0.3mm which allow designs with differing corner radii to be cut, while the machines can deliver components with taper angles up to 30 degrees. The two Sodick wire eroders operated by MNB are amongst the fastest cutting machines on the market. Indeed, the top of the range AQ750 also has one of the highest capacities available – it is one of only a handful of such units in the UK and can accommodate workpieces of maximum dimensions larger than 1 metre. The machines are CAD/CAM driven, using our Solidworks system, and the continuous automated operation is further enhanced by a remote feature enabling operator control over the internet. While the concept of an unmanned facility is still some way in the future, this kind of technology allows us to maximise the efficiency of the operation and turnaround times for our customers. Timely & Flexible – We work in a timely and flexible manner here at MNB Precision. We work closely with our clients to ensure every project is completed within set deadlines to the highest standard. Technology Driven – We continuously update our machinery and materials to ensure products are the very best they can be. Along with the use of state-of-the-art technology our team of professional Engineers oversee each project. Highly Reputable – We have a broad range of clients, and have 30 years’ experience in the Precision Engineering Industry working with the likes of Mercedes Benz and Honda. High-Quality – Here at MNB Precision, quality is assured with every product manufactured, both large and small. Each product we create at MNB goes through testing before the project finishes, products must pass our checks to be approved. Capabilities – We not only provide Wire Erosion Services, but we also provide a wide variety of Precision Engineering Services. For more information on Wire Erosion why not take a look at our article The Basics to Wire Erosion. If you would like more information on our Wire Erosion Services Spark Erosion Services or any of our other services, get in touch (LINK) with us today on 02476 695 959. Fancy working for us? Check out our careers page.